An ideal token of love, this stunning 9ct white gold heart pendant is ideal for keeping photos of loved ones close to heart. Featuring a diamond pattern on the case for extra sparkle. 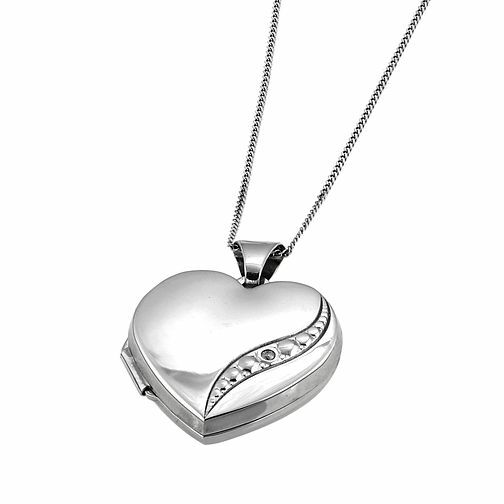 9ct White Gold Diamond Locket is rated 3.8 out of 5 by 8. Rated 1 out of 5 by Anonymous from Arrived Damaged badly dented This locket arrived damaged and dented which caused me to have to drive some way to find a shop to exchange for another one in time for Valentine’s Day. Hugely annoyed is an understatement!! Apparently no quality control or checking upon despatch to me? Aside from this the replacement locket was quite thin and light, giving the impression they used the minimal amount of metal in production to maximise profit and sacrifice quality. Rated 4 out of 5 by Anonymous from Understated beautiful locket I purchased this locket for my daughter to wear at her forthcoming wedding - I wanted something understated and pretty My daughter absolutely loves it!